Click here to skip the review and order your Trunki! This product that I am going to write about next (or rave about to be exact) is something I discovered when looking for a nice backpack for my preschooler to travel with. We were planning a long trip abroad and I needed some storage space for my son to keep all his toys in. I also wanted something that he would love carrying around himself. 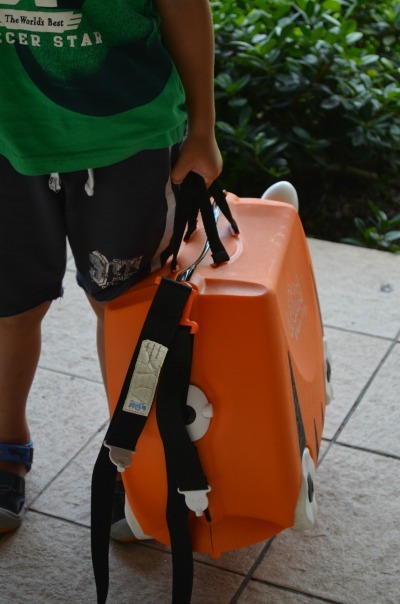 When I came across Trunki suitcase I thought it was a very clever toy and I knew right away that it would keep my son occupied. Little did I know at that time, that it would become an irreplaceable part of our luggage and life! Now, with the experience of using and abusing our Trunki, I declare with confidence: that is one of the smartest things I've ever purchased for my son! It provides functional storage space on wheels and it is an amusing activity toy to take along. 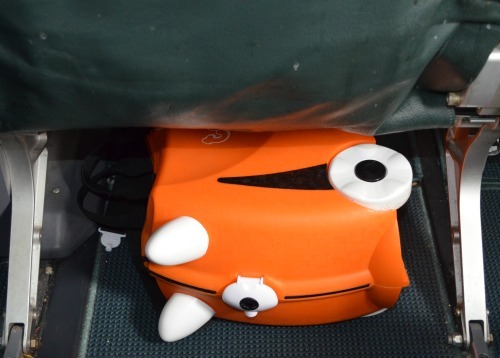 A suitcase and a great toy - how clever is this?! 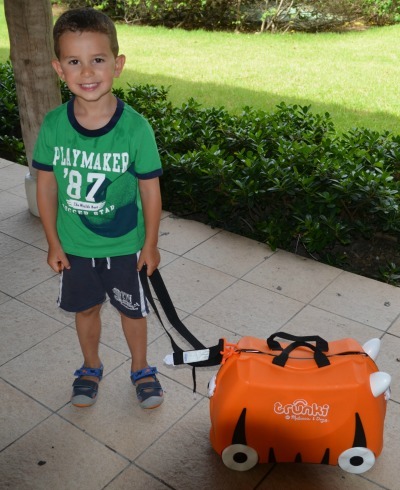 Trunki is great for taking on vacations (air, train, car), sleepovers, summer camps – and just about anywhere your child goes. Ride on, tag along or carry – whatever we did with it was all fun. We loved the look of it too! My son picked the orange tiger one called Sunny. He loved pulling and pushing it around the house all the time up until the travel day. Trunki even "slept" by his bedroom. Good to Know: Trunkis were originally designed in the UK. The ones that say “Melissa and Doug” on them are made here in the US. They are the same Trunkis made affordable by being produced domestically. US Trunkis comply with US ASTM (American Society for Testing and Materials) safety standards. 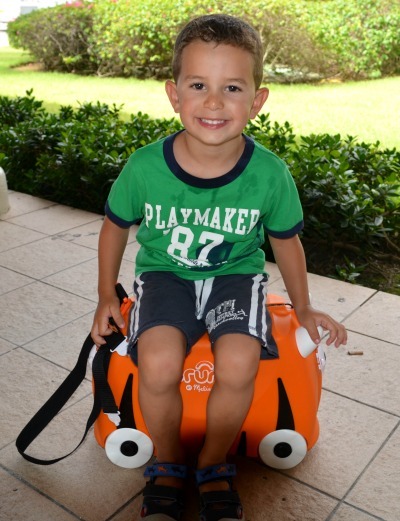 Trunki can be used by kids for riding on, pulling along or just sitting on. It has the perfect length, width, weight and a comfortable saddle for whatever your kid wants to do with it. Trunki can also be used at home as a storage space for toys. It can also be pulled along by the parent with the child sitting on it, or carried over the shoulder. The long strap easily converts into a shoulder strap. 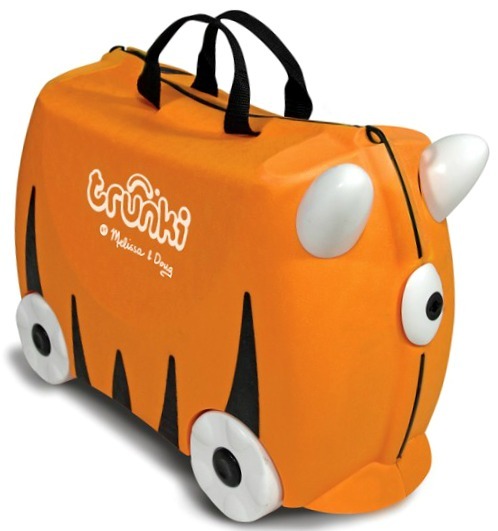 Whether you wait in the check-in line, rush to the gate or simply need to walk a distance, Trunki is designed to help. I recommend checking with the airline (if traveling by air) for personal item size allowance, as it frequently changes. But from my experience and from what I found on several major airline websites, Trunki meets the requirement and can accompany your kid as a personal item (better than carry-on!). 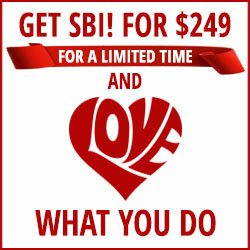 So, no additional fees! Important: Notwithstanding its durability, I don't recommend checking Trunki in with the rest of the luggage. Especially since you have to pay for extra luggage nowadays. You will be better off checking in a larger bag and carrying Trunki with you. 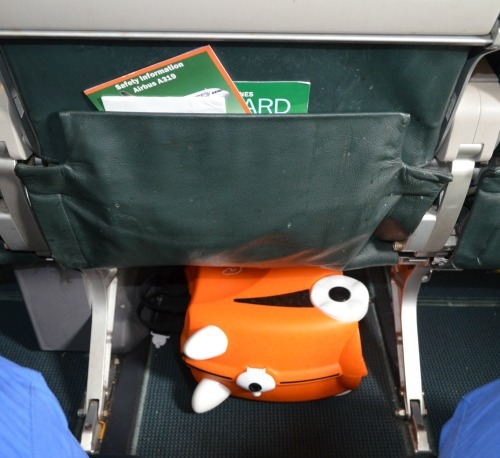 On the plane Trunki fits perfectly in the overhead compartment. But we liked to keep it underneath the seat in front of us. Trunki was just the right size! 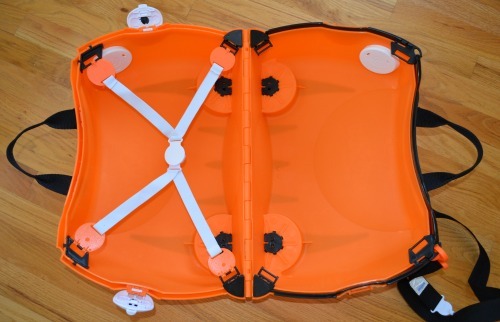 There are 5 little stabilizers on each wheel designed to prevent the suitcase from toppling over. 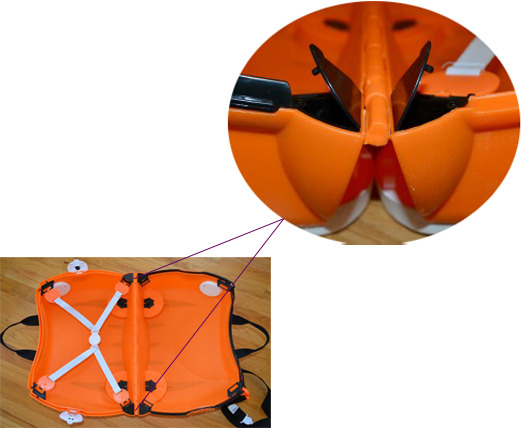 There are also two more stabilizers: one at the front and one at the back of the suitcase. These stabilizers did a great job during our trip. Even when going through a long security check line at the airport with lots of twists and turns, Trunki managed the task perfectly and never toppled. 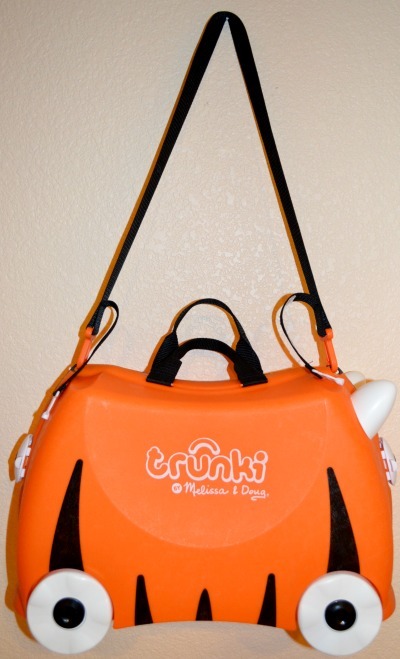 Check out the variety of colors available and order your Trunki on Amazon today. I love that there are locks on both sides of the suitcase. And the keys are attached to the long strap, so you can’t lose them. Locking the suitcase gave me assurance that it wasn’t going to open all of a sudden with my son on it. Locks are easy enough for a kid to figure out, so they don't have to get you every time they need to open their suitcase. I was first a little unsure about the leg room for my son when riding the Trunki. He is a tall boy and I didn’t know where he would put those legs. Well, there is a reason it is kids’ toy! He quickly figured what he was supposed to do. Two horns at the front of the suitcase are perfect for resting little legs on them. 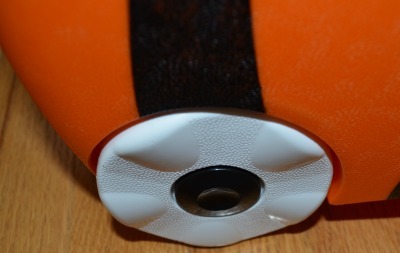 They can also be used as hand grips, if your child prefers to keep his/her legs on the sides of the case. My son was riding very comfortably and I didn’t have to worry about his legs being caught under the wheels. Trunki is very light due to the lightweight, but durable, material it is made of. Weighing only 3.2lb, when empty, it wasn’t too heavy when packed either. My 4-year-old actually picked it up a couple of times. And I was able to easily carry it over my shoulder, when needed. 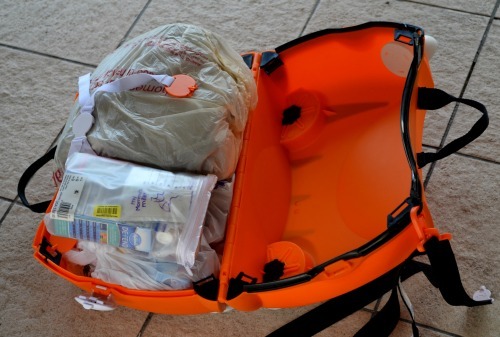 Note, that you can fill it up to 75lb, if you need to. There is an ID label attached to the long strap. Kids love this feature, as they can mark it with their name (or whatever they feel like scribbling on it) and feel important and all grown-up about it. 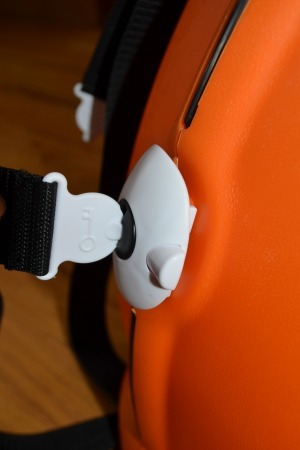 The stretchable strap inside the suitcase designed to hold the contents in place looked like a great idea. I must say ours didn’t work very well. It kept on coming out of its holders all the time. But then how often do you use the straps that come with your suitcase? Even if you do, keep in mind, Trunki is a little case. Chances are you won't miss this strap if it doesn't function properly. We didn't! There are 4 tiny compartments inside Trunki for little "priceless" possessions. My son kept several dimes in there (we have a tradition of tossing them into the ocean before leaving and promising to return). But if not for that - you know kids love tiny things to hold on to. This is the perfect place for stashing their special treasures! There is a variety of cute stickers made for Trunkis. Your little designer can add a face to their animal Trunki or write his/her name on it with letter stickers! Check them out here. Trunki is very easy to clean with just a wet cloth, both inside and outside. 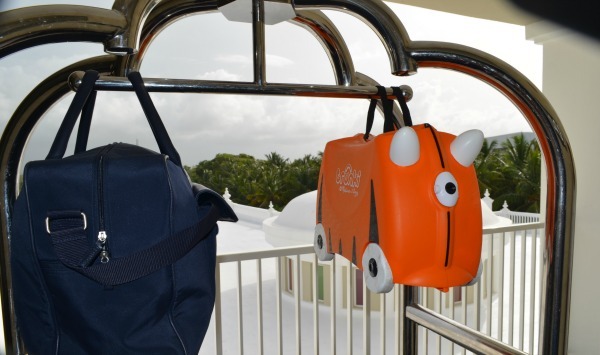 Besides all the features we loved, Trunki was a lot of fun to travel with. It was the center of everyone's attention and I can't tell you how many times I repeated what it's called and where I bought it. 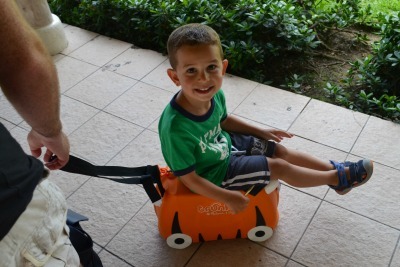 All kids loved it and my son was a proud Trunki owner! Whether you are traveling long distance or just running errands, Trunki will keep you well organized and will keep your children busy. Your kids will also have a lot of fun using it at home for storing toys. We absolutely loved testing our Trunki and I know you will enjoy all the features and benefits it provides. Click here to pick the color and order your Trunki from Amazon!